The DWFO door frame miller and drill is a machine designed for making openings for the installation of hinges in the frame stiles, and also for the recess under the lock plating. The machine’s base consists of two welded steel bodies connected by beams. 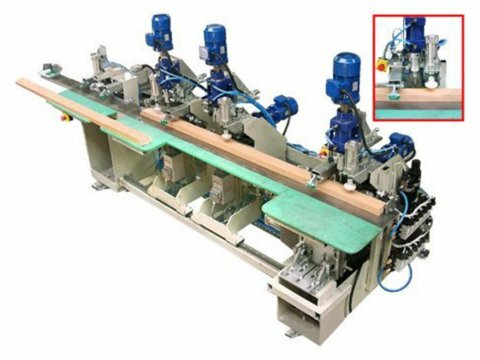 The machine is equipped with six drilling units and four milling units. The center body with the installed working units has the capability of changing its position depending on the worked stile (for right or left doors). After the manual loading and shifting the stile do the stopping bases, a signal is given by foot pedal for the clamping of the material. Then, using a button from the console, the process of drilling and milling is started. After the finished work process, the stile is automatically unclamped. The high-speed electrospindles applied in the machine ensure excellent quality of milled recessed and high machine efficiency. One work cycle lasts about 30 seconds.